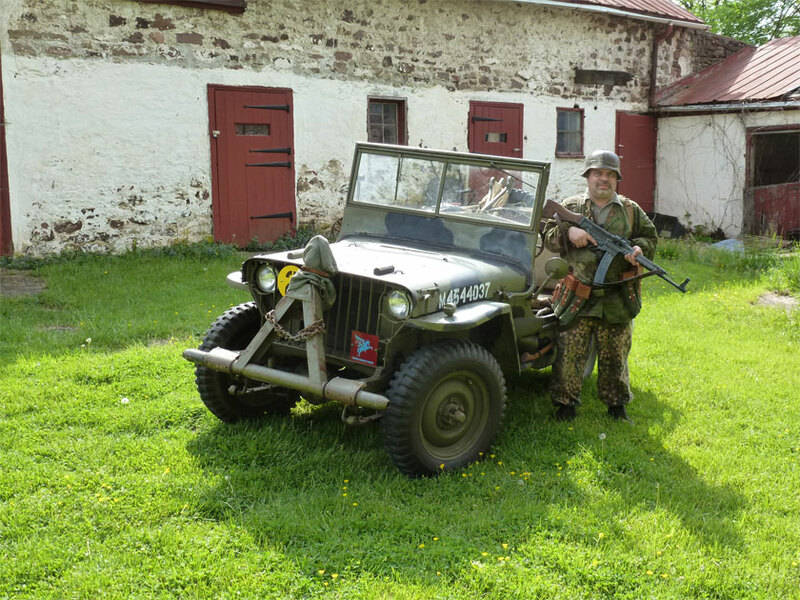 On May 5 and 6th Jim Cherry helped run a WW2 Living History at Graeme Park in Horsham, PA. This is right around the corner from the now defunct Willow Grove Naval Airstation. 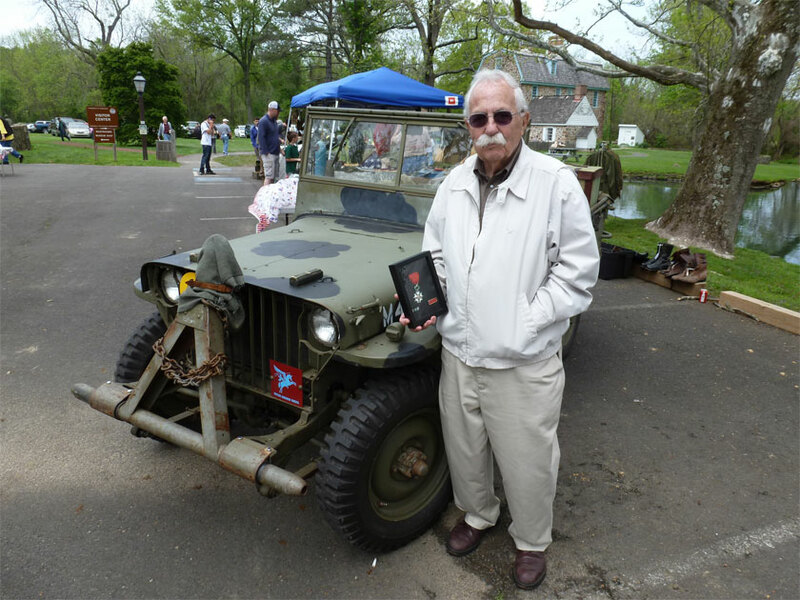 As his Jeep was not going to be ready I offerred to bring my 1942 slatgrill Jeep to the show. This was a wonderful event in a great location. The old mansion and outbuildings are reminiscent of rural France. There was a big band playing all day on Saturday, and a tactical battle that ended in public view. We met a few veterans, some old friends, and overall had a nice, mellow day. This photo is of Herb Levy, he was in the 9th Engineers Combat Command in WW2. We chatted for a few minutes and he is holding his French medal. Honestly I would not have taken him for a WW2 veteran, very spry and lively, some folks just have good genes. There were a few beautiful vehicles present. Oddly mine was the only Jeep, we need more Jeeps to come next year!! 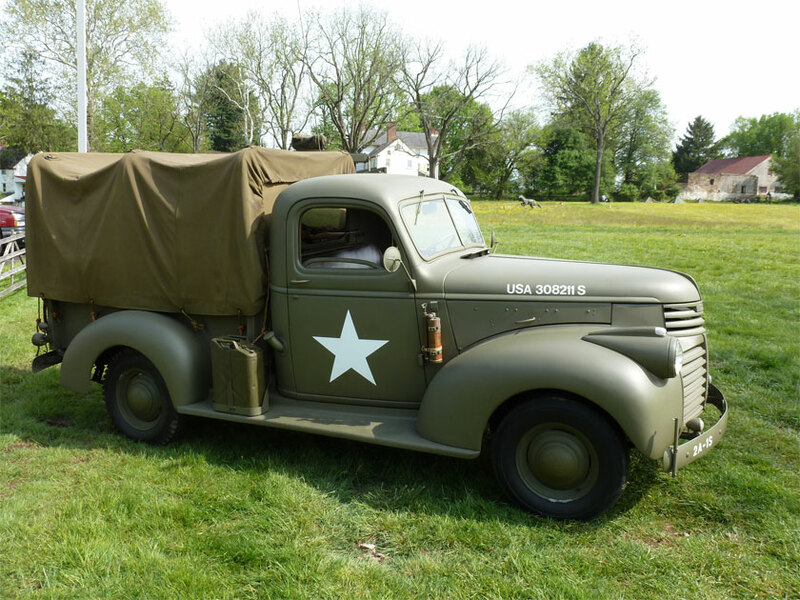 This truck was a fine example of an early war GMC. There was also a staff car and I think a weapons carrier. 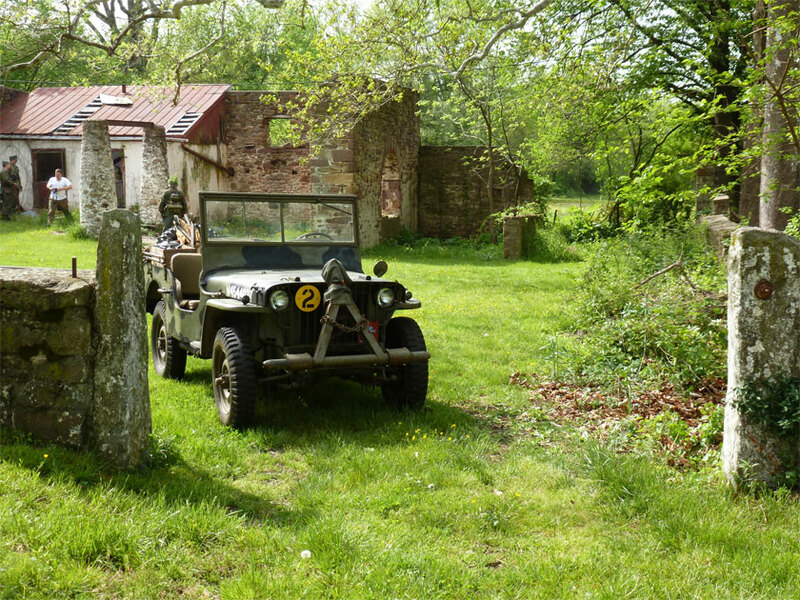 While taking some photos of my Jeep in this wonderful setting we had some Germans sneak up. Actually I think we interrupted their photo shoot. Next thing I know my Jeep was captured!! I thought this was a nice shot to leave folks with. Once again, the setting was perfect for some good WW2 photos. I highly recommend this event for next year as it can only get bigger and better. Last weekend Mike, Bobby and I headed out to Horsham, PA to attend a WW2 living history at Graeme park. The reason for going was that our customer, Jim, and his family had helped develop this into a larger event. As his Jeep was taking a bit longer than the target date I promised to have my Jeep at the show for him. I will post more about the event in the next time. The bonus of attending this event was that Jim’s father, Dale Cherry, runs the speed shop Injection Connection. 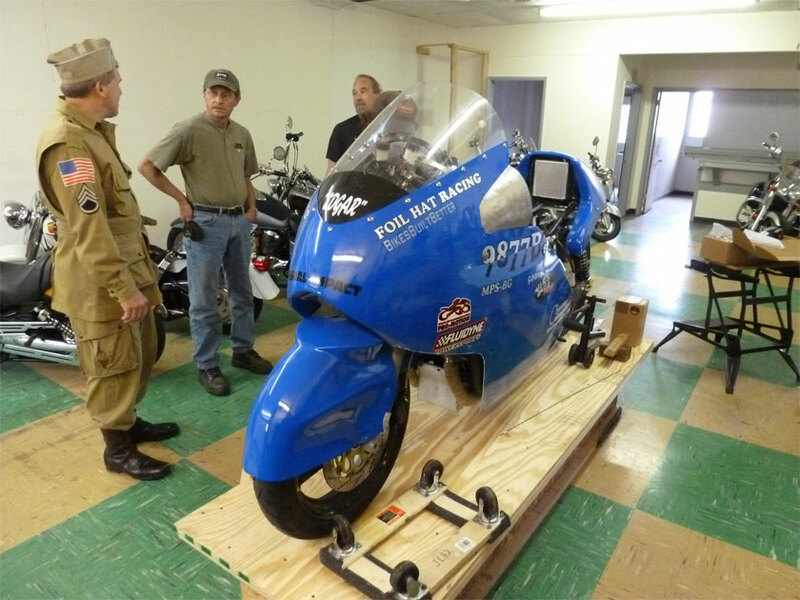 Dale has a couple Bonneville Salt Flats records under his belt and very graciously took time away from the event to give us a tour of his facility, and the neighboring motorcycle shop. All I can say is that Dal is a knowledgeable, laid back and down to earth individual who I would trust with any project. I really enjoy talking with him and have learned alot from our conversations. Dale was in WW2 US Airborne uniform for the event. This is him showing us around the back part of his shop. This car had a wee bit of a fire when a flying part blew the fuel cell. The other side was scorched! Luckily the driver escaped the vehicular flambe without harm. Dale’s shop is rebuilding the car. 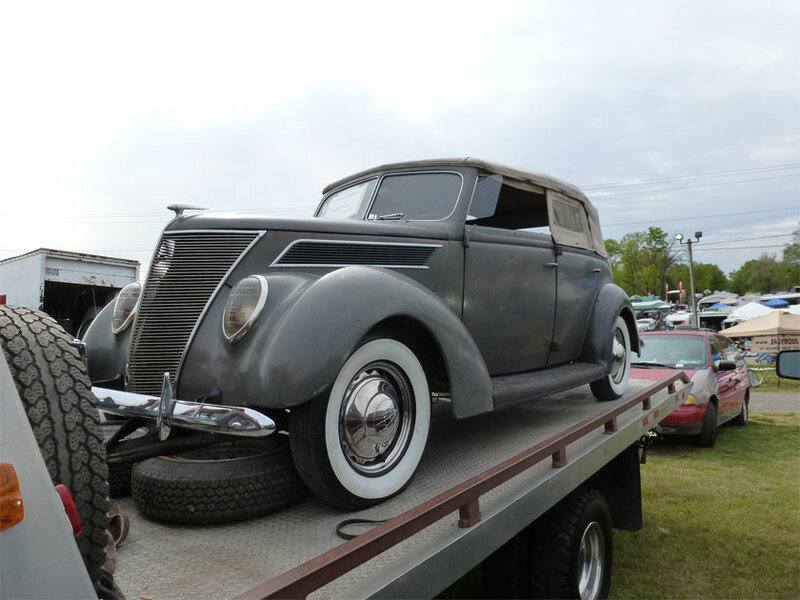 These project cars (1931 Dodges if I remember right) were sitting outside. Dale and Jim rescued them from a collapsed garage. 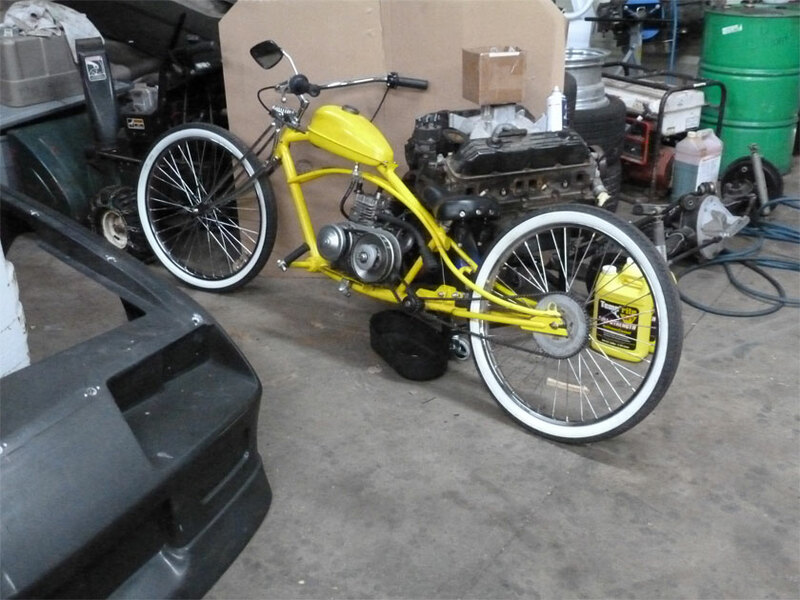 I just had to include this lowrider whizzer from Dale’s shop. Too cool! This motorcycle named “Edgar” is in the neighboring shop. The fellows in that shop have set a couple records at Bonneville with Edgar. 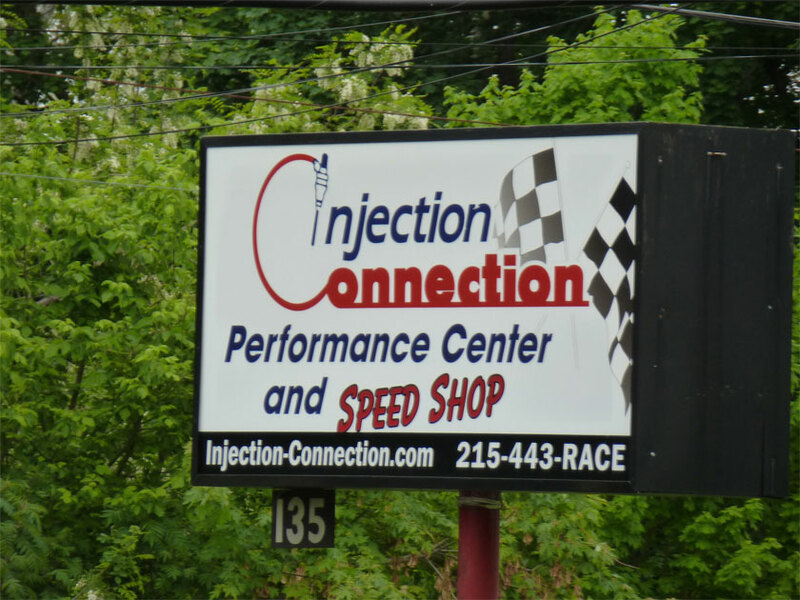 For the life of me I cannot remember the name of their shop, it is next door to Injection Connection in Horsham, PA. I have to say thanks once again to Dale for giving us the tour!! This past Saturday my buddy Mike and I went to the Carlisle spring show. MIke reminded me all week that there would be no sleeping in and I actually managed to wake up early on a Saturday morning for once. At 6am Mike was in the driveway waiting for me and the adventure began. 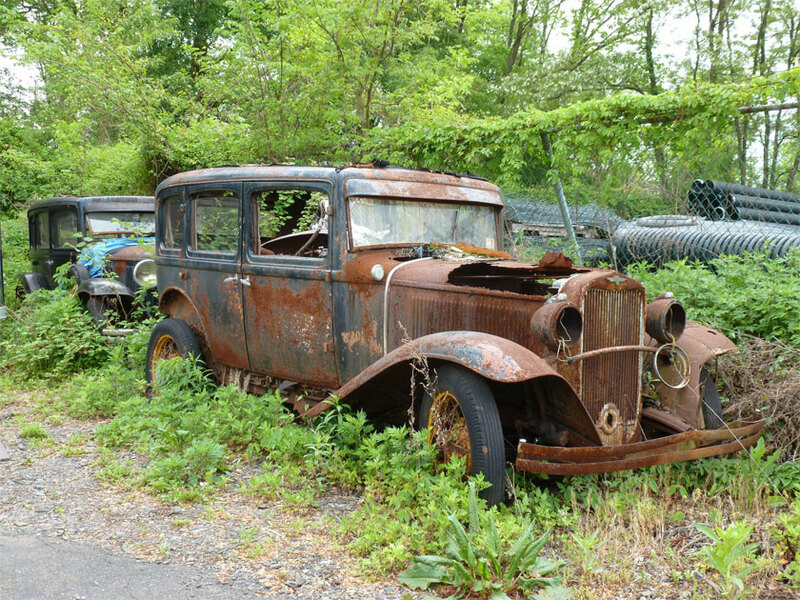 The drive up route 30 through Hanover PA was quite pleasant and we saw that some folks had pushed barn finds out on lawns to catch the eyes of those driving to Carlisle. I saw a couple Chevy C-10’s that reminded me of my 1964 Chevy truck that I stupidly sold many years ago. 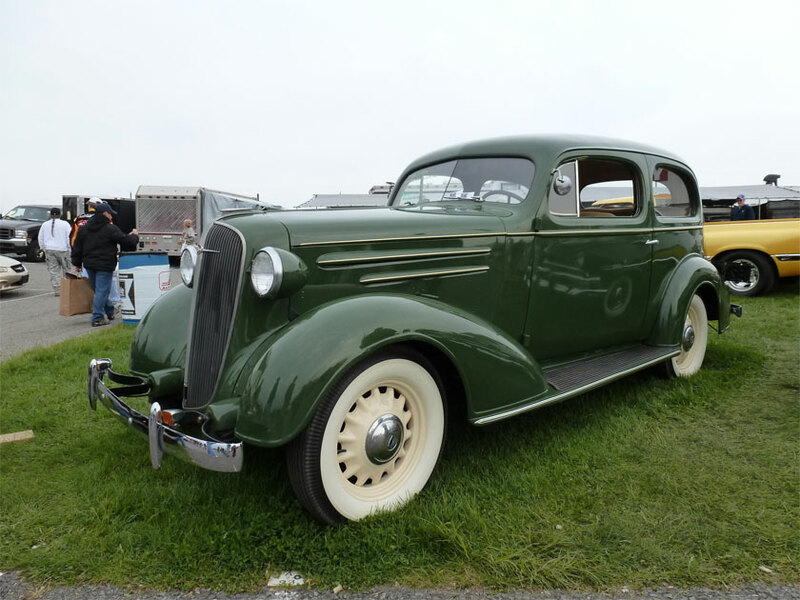 In this post I will share some of my favorite 1930’s sedans from Carlisle. The first is a 1937 Ford Phaeton. It looked very original and unrestored. What a beautiful find. If only I had $27,000 in my pocket. But I would be afraid to restore it as it seemed so original. 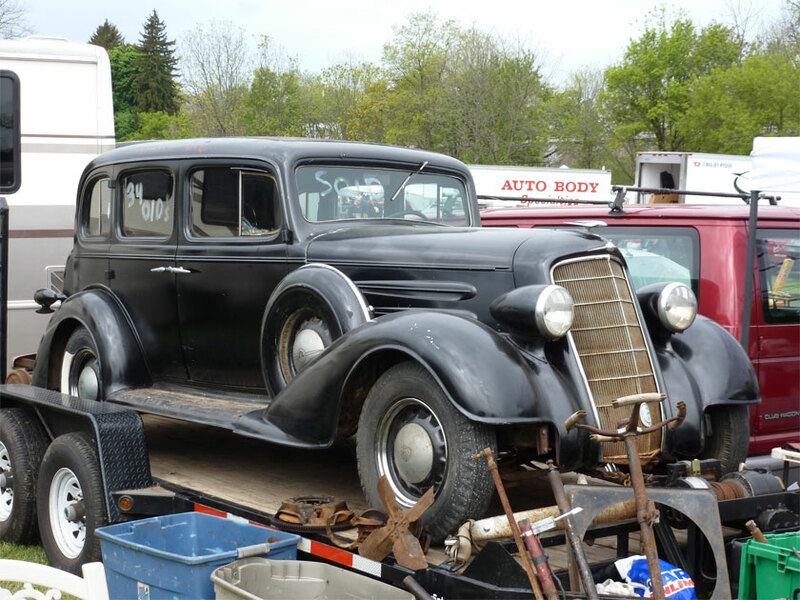 Our second car was a 1934 Oldsmobile. I need one of these and a Thompson gun to accesorize with my trench coat and fedora.